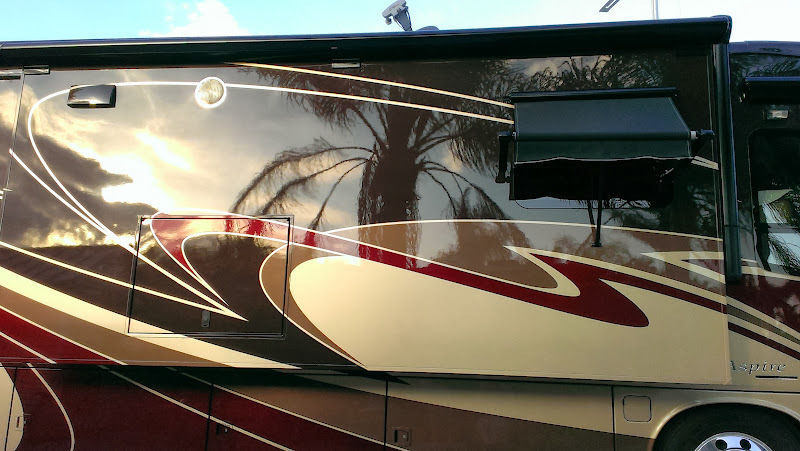 Home→Mods, Tech Talk & Tips→Product & Service Reviews→RV→So Squeaky Clean! 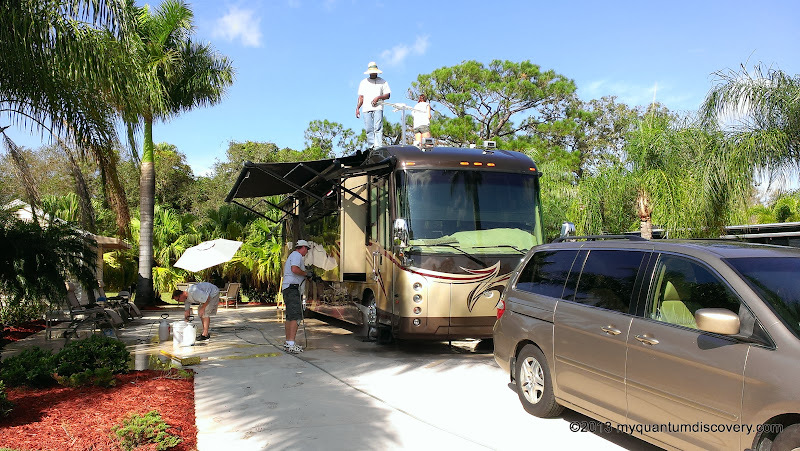 While riding around the resort at Riverbend, we noticed several coaches on any given day being cleaned by one of two local “coach detailing” outfits – Mobile Wash and Dazzling Detail. Our coach was pretty grimy too, but being the DIY’ers that we are, we figured we would just take a day and do it ourselves. Each day we talked about it but we always found another excuse or something else that needed doing. Shortly after New Year’s, on one particular nice sunny, warm day, Rob decided that the time had come to pressure wash the beast. 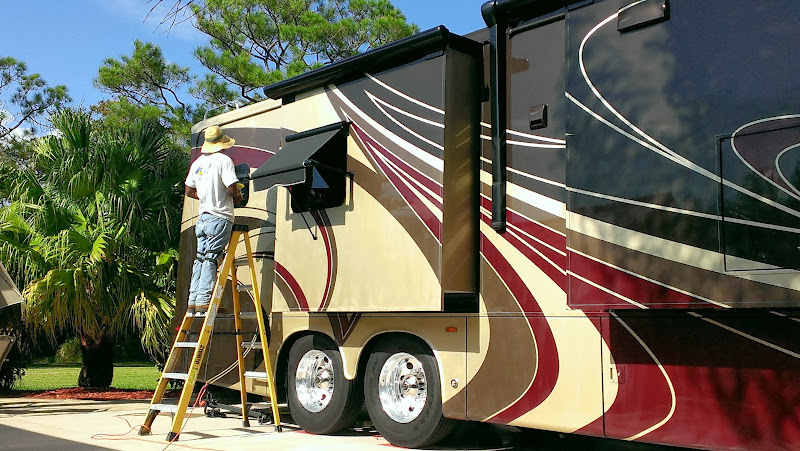 The majority of campgrounds don’t allow you to wash anything, but here at RiverBend where they have their own water processing system, you are allowed to wash your coach or vehicle (except on Sundays) as long as you use a pressure washer (to conserve water). If we didn’t do it on this particular day, who knows when we would have another opportunity. No sooner had Rob unpacked our pressure washer when Mobile Wash showed up to wash the coach next door. Hmmm, I thought, maybe this was a sign, maybe we could have them do us as well! Trust me I wasn’t looking forward to washing and/or waxing so I put on my most special “oh, honey, please can we” look, whined and cajoled until I convinced my adorable hubby, aka Mr. DIY, that they might possibly do a better job than we could. We talked to one of the guys near the truck and the next thing we knew, the owner of the company came over to talk to us. 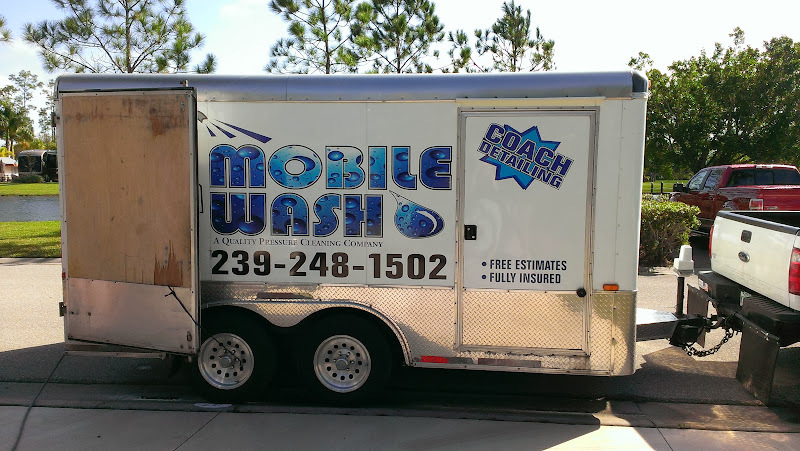 Mobile Wash is out of Naples, FL and has 3 trucks and a crew of about 15 people. 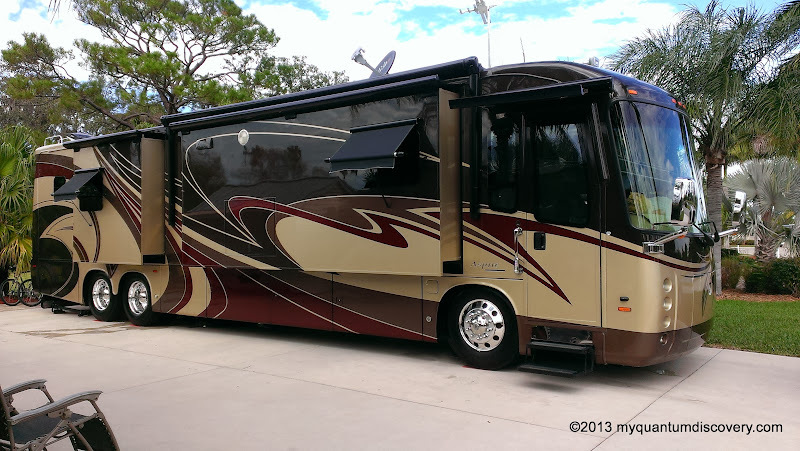 Everything Larry said sounded great and there were no issues getting it done before our departure date on the 4th so by the time he finished his sales spiel, not only did we agree to a wash, but also a wax, plus a thorough cleaning and polishing of the aluminum wheels too. Oh, and let’s throw in a car wash as well. Oh joy! They couldn’t do it that day but they would be back at 9 am the next day. The price was reasonable too considering the man hours involved. Well, the next day 9 am came and went but we knew they would be at our site shortly since one of their trucks was parked down the road doing another RV. It was probably close to 11 am when a crew of 4 showed up. While we watched, they quickly got everything set up and started washing. Boy, there wasn’t one spot that didn’t get scrubbed including all those hard to reach places on the roof including the AC, the vents, and the TV antenna. Even the awnings,the awning arms, under the slides, the generator door and all kinds of other nooks and crannies. Ah, yes, a much better job than we would ever do although I probably shouldn’t speak for my other half, I should say it was a much better job than I would ever do. Finally about an hour and a half later, Larry told us that they were leaving to let our coach dry but they would be back in an hour to begin the “waxing”. 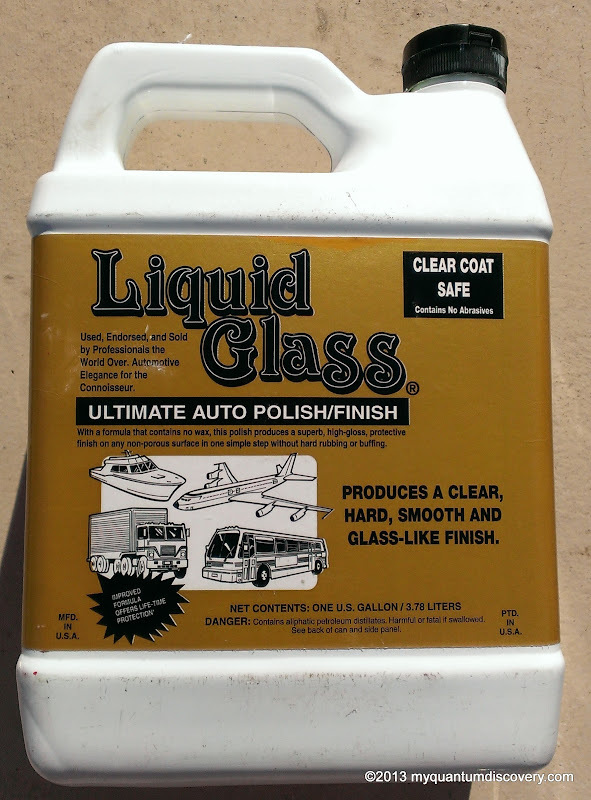 Actually they use a product called Liquid Glass which is not actually a wax at all, and provides a much more durable finish than ordinary wax products. Expensive too, about $30/pint at retail. About 1:30 pm one of the guys was dropped off, equipped with everything he needed for polishing including an electric buffer with a foam pad. Larry had told us that the wash, wax and doing the wheels would be an all day job but I figured it would be an all day job for multiple people, not just one guy. Didn’t seem to phase him though – what a great job he was doing! All afternoon long he kept at it. My arms were aching just watching him but I guess he’s used to it since he does this every day – for me, it is a once a year event! Finally around 4 pm about 6 more of his co-workers showed up in one of their other trucks including Larry, the owner. Since sunset wasn’t too far away, the race was on to get everything finalized before dark. Although Larry was kidding around with his employees (free entertainment for us! ), the entire time he was working on the wheels he was still barking out orders to each of them to make sure there wasn’t a dirt or water spot anywhere. Under the slide edges, around the edges of all the cargo bay doors, etc. They even treated the rubber strips around the slide rooms. Now I know why they call it “detailing”! It was about 6:45 pm and getting dark when they finally finished. Wow, the Beast had turned into a real Beauty! Every inch was sparkling and shiny! Very impressive! Much better even than the day we picked it up from the dealer – no kidding! 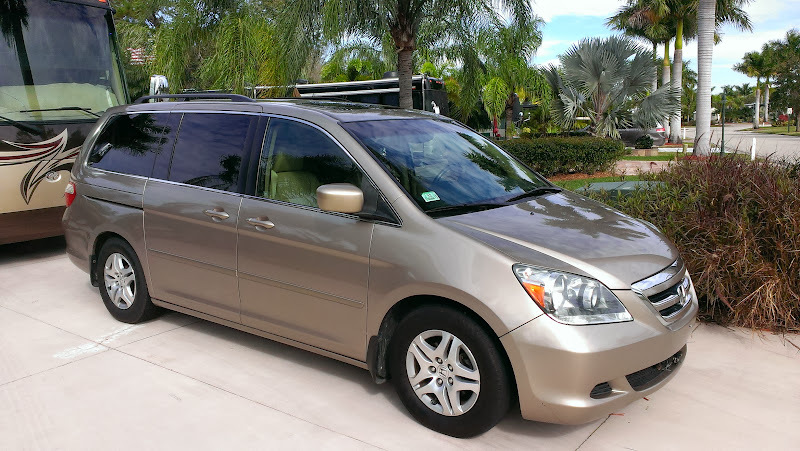 And the van was all shiny and clean as well (and free of the big blob of sap in the middle of the windshield). But wouldn’t you know, about an hour after they finished, it rained! Couldn’t Mother Nature at least have waited until the next day to throw raindrops on our squeaky clean coach and van??? Well no big deal, the next day the coach and car still looked just as good, there was no negative impact from the rain. Overall we were very impressed with Larry and his friendly team from Mobile Wash (you can get the phone number from the photos). They serve south west FL and are headquartered in Naples. The attention to detail surpassed our expectations. Also, the products used were of high quality and produced a noticeably superior result. Hi Amber, glad you enjoyed reading our post. 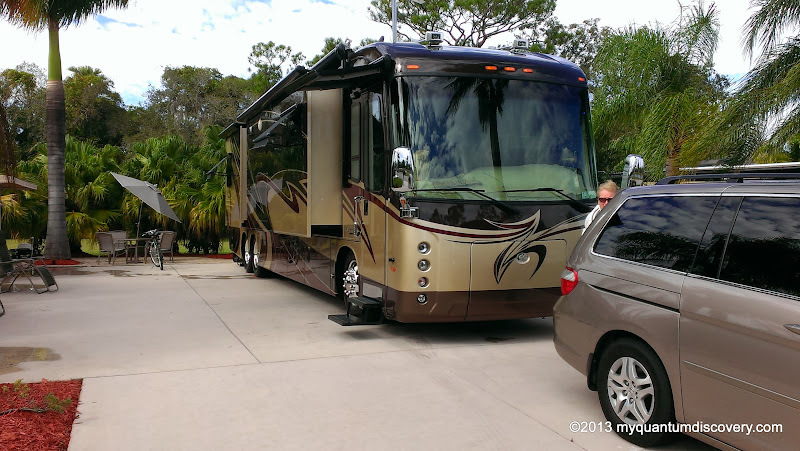 We also stayed at Riverbend for the month of December 2014 and had Mobile Wash clean our coach for the second time. We mentioned it in a more recent post titled “December at Riverbend” dated January 3rd, 2015. Another great job! I think it will be annual thing. Maybe we should get a discount next time? HA HA! I moved to have such great accolades by you and yours. I hope our paths cross again as always it is a pleasure to serve good people. 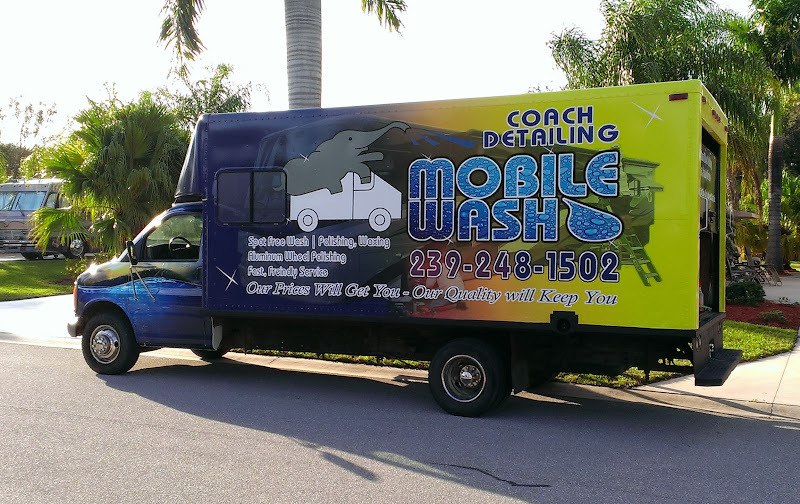 We as a company… Mobile Wash look forward to serving you again. We bought a lot at Riverbend last spring and plan to be back there for the months of November & December. I’m sure by then our coach will need a bath so we’ll most likely be in touch!